Finally, I have decided upon the phrase for the Hallowe'en Blog Hop and will be emailing participants over the weekend so they can prepare to post on Tuesday 31st. Congrats on all of the super cute finishes and nice start Jo. Jo, you are always so busy with so many wonderful stitches. I especially like the smiling jack and I look forward to seeing progress on the Shepherd Bush piece. They are all great. Have a lovely weekend. I love all the Halloween smalls! Another productive month for you! Everything is so cute! Great smalls this time again, the parts of bigger designs as well as the individual smalls. Beautiful stitching Jo! Love the tiny pumpkins on spooky night! Great stitching Jo, I like "Spooky" is it a variegated orange for the text? Lots of lovely smalls to feast the eyes on. Your productivity is amazing!!! And beautiful! Hopefully you will inspire me to be a little bit more productive. 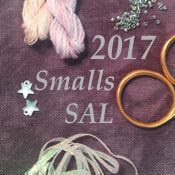 So many smalls this month! They all are lovely.